Iryna Skorokhodova brings eighteen years of professional experience to her role as founder and CEO of STRIX Property Investment Boutique. As Vice President of Alfa Bank Ukraine, she has been responsible since 2012 for the sale and management of a broad commercial property portfolio. Over the past year alone, Skorokhodova has been instrumental in some of the biggest transactions to take place on the Ukrainian property market worth a total of USD 240 million, including a key role in the sale of Kyiv’s 69,000 square meter Horizon Park Business Center, which was widely hailed as the Ukrainian office real estate deal of the decade. She is now leveraging this experience at the head of a company that aims to act as a one-stop-shop bringing together international real estate investors and Ukrainian property owners. Skorokhodova shared her recipe for Kyiv property investment success with Business Ukraine magazine and explained why she believes many international investors have yet to appreciate the full potential of the Ukrainian real estate market. What do you regard as the most exciting investment opportunities in today’s Kyiv real estate market? The Kyiv market is currently enjoying a prolonged period of expansion and this is creating opportunities in a range of different property sectors. For example, rents for many Class B business centers have risen by 40-45% over the past two years, while vacancy rates have dropped to around 2% to 3%. In the Class A segment, rents are up 20-25% and occupancy is 92% or higher. Meanwhile, existing contracts signed before the current upward trend began now face renewal under current market conditions, which should ensure further growth in yields. What are the most common traps any property investor entering the Ukrainian market must seek to avoid? Excessive prices for services are common in any business environment and this is equally true of the Ukrainian property market. Our company’s core principle is transparent management. This means public tenders for contractors and services. To give a specific example, during a recent facility management tender for a Kyiv business center, we received offers that varied from USD 55,000 per year to USD 250,000, with little discernable difference in the quality of the services on offer. This illustrates the dangers facing anyone looking to get a fair price without the requisite experience to navigate the market. 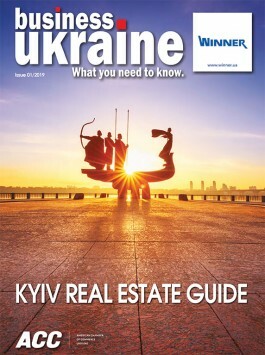 How do you envisage your role as a partner for international real estate investors in Ukraine? It is a fact that international investors can make attractive profits on the Ukrainian real estate market. However, it is also a fact that many are not yet aware of all the specifics of the local market. Some international investors have had negative prior experiences that have created the wrong impression about today’s Ukrainian market. This has often been due to a lack of credible partners ready to act in the interests of the investor. Our team can provide a complete range of services for international property investors to help them identify the right real estate, carry out all necessary background checks, and negotiate the most advantageous purchase terms. Following acquisition, we offer property management services to ensure ongoing profitability for the new owner. Thanks to my eighteen years of experience on the real estate market and trust-based relationships with many of the country’s leading property owners, we can also offer potential clients projects that are not available on the open market. Many Ukrainian property owners prefer to avoid public listings, so the best opportunities might not necessarily be easy to find. What is your strategy for identifying the most attractive opportunities in a sector where information is not always openly available? Our key asset is our reputation and we intend to guard this by offering maximum transparency to our clients. Prior to any acquisition, we hold a detailed property audit and search for hidden pitfalls while double-checking to avoid any possible frauds. It is entirely realistic to run a fair and compliant business in Ukraine if you adopt the right approach. Your new property investment boutique seeks to play an intermediary role between international investors and Ukrainian real estate owners. What kind of additional value can you offer to property owners? We provide full sales support for commercial property owners. Any sale begins with the right preparation. It is crucial to gauge the maximum potential of the property, including everything from the profit margins it could bring for new owners, to the potential for further development or redevelopment. Our task is to analyze the asset independently in order to identify hidden potential and eliminate inefficiencies. Sometimes it might make sense to take on the management of a property in order to improve its operational profitability prior to a future sale. The next stage is the sale process itself. If the owner wants to pursue a public sales strategy, this means international promotion through global platforms and major industry events such as MIPIM in Cannes. In cases where the owner prefers to maintain confidentiality, our approach is to organize private presentations.